Did you know that the warning signs for a heart attack are different for men and women? 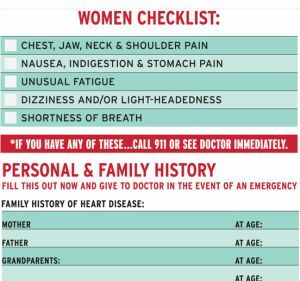 It's vitally important for women to be able to recognize the warning signs of a heart attack because there is only a small window of time after a heart attack before the heart starts dying. Print this checklist of warning signs and keep it in your wallet - it just might save your life.